The cost for legal services in Oakland Township has doubled under the Board the citizens elected in 2012. The yearly expenditure went from slightly over $100,000 to $200,000. This post is intended to give the citizens some insight into what is driving that, how difficult is has been to find the information necessary to put this report together, and some specific recommendations for the Board to consider. The yearly legal expense incurred by our Township Board has almost doubled since the existing Board came into office in 2012. One of the first actions that the new Board took was to replace the Legal firm that had been working for the Township for years. The yearly legal expense to the Township increased at the same time this change occurred. Here is a graph showing the historical fiscal year legal expense, as well as the budgeted amount for future years. In order to understand the reasons for the increase in the Board’s legal fees, a review of the legal bills was undertaken. In looking at the readily available documents the Township posts, it became apparent that decisions had been made regarding how much information would be provided residents. The information went from very vague and useless (prior to July 2, 2014), to fairly informative (July 2, 2014 to Feb 24, 2015), back to very vague and useless (after Feb 24, 2015). Examples of this will be shared later in this post. Supervisor Gonser’s actions may provide some insight into the apparent policy change on how much information was to be made available to the residents. On March 24, 2015, Supervisor Gonser accused Trustee Buxar of inappropriately providing legal financial records to the author of this post. His accusation was proven to be false, but more importantly it reflected his position on sharing legal financial information with residents. Here is a video of his accusation and the response. Although there is a difference between the fiscal year and the calendar year for Oakland Township, the calendar year to date expenditure totals $87,000. 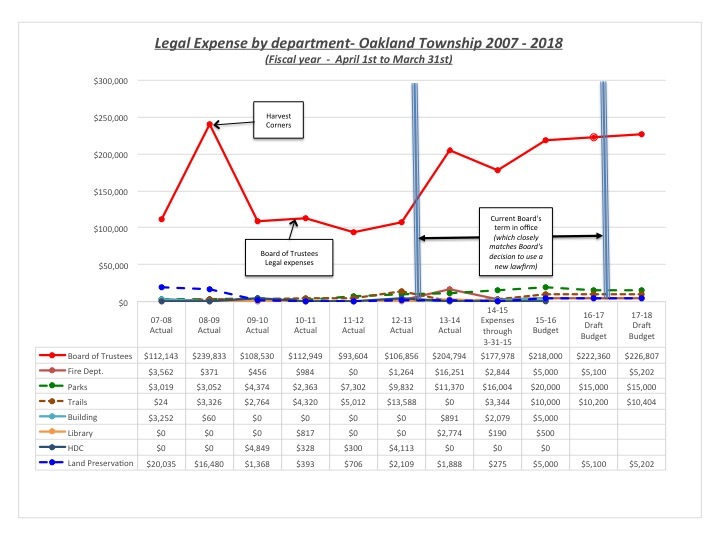 If that spending rate continues for the entire fiscal 2015-2016 fiscal year, we will spend $209,000 very close to the budgeted amount, but still twice what Oakland Township has historically spent for legal bills. There is no documentation on how many hours the attorney has spent on Township business as part of the $9,000 per month retainer fee. The retainer fee approach was instituted when this Board came into office. 17% of the legal expense is due to ‘Labor and Employment’. Much of this is due to the unionization efforts of Township employees that started when this Board came into office. 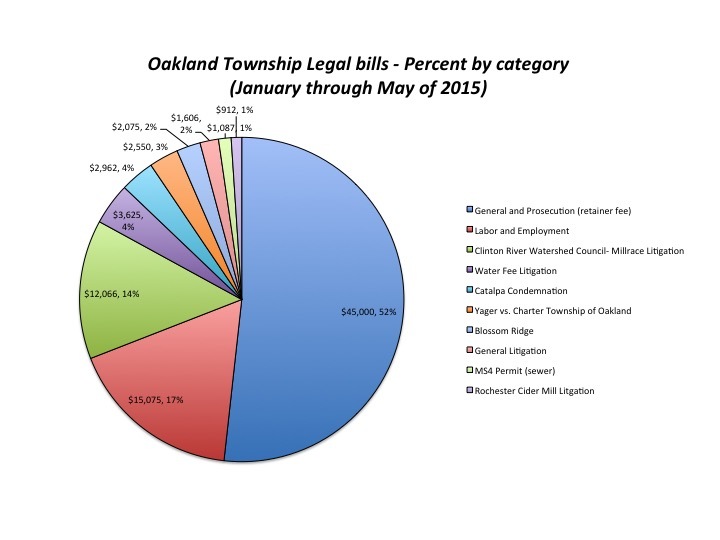 14% of the legal expense is due to Oakland Township suing the Clinton River Watershed Council over the impact the removal of the dam had on the millrace and its property owners. This issue, along with Blossom Ridge, was a campaign issue that helped many of the incumbent Board members get into office. 4% of the legal expense is due to the decision the Board made to not consider using Detroit City water, hence driving the need to refund millions of dollars to developers and some property owners. Why is this important to the citizens of Oakland Township? The citizens of Oakland Township elected most of our current Board (one was recently appointed when Maureen Thalmann resigned). Some of the campaign items the Board ran on resulted in increased legal expenditures. However, did the citizens recognize that our legal expenditures would double? Has the Board and or Supervisor made decisions to make it difficult for citizens to understand where the legal expenses are being incurred? Is it consistent with their repeated claims about being transparent? The $9,000 per month retainer fee implemented by this Board. The $9,000 per month fee results in an annual expense of $108,000 – approximately the previous legal yearly expenditure which included litigation and labor. Several Board decisions that are driving the litigation expense up. The behavior of the Board that drove the employees to join unions, and the resultant increase in Labor legal expense. All of these items are now history, and there is nothing we can do about it. However, going forward, I believe the transparency of the legal bills needs to improve. Citizens should not have to FOIA records to see what is driving the legal expenditures. Clearly that community’s leadership feels that litigation activities are important and deserve to be shared with their citizens. The monthly Board packet should identify the plaintiff & defendant in each lawsuit, and the amount of money spent on each litigation item. The Board should request an hourly summary of what all is being covered in the retainer fee. We need to understand if we are “getting our money’s worth”. A running tab should be created for each litigation issue, so the residents understand the total amount of money spent on each lawsuit we either initiated or are defending. As part of the retainer fee service, our Township attorney should generate a quarterly report showing the status on all litigation activities (similar to Troy’s report). The Board should ensure the Litigation report is posted on the Township website. As mentioned above, here are examples of the transition of quality of information provided by the Township in their monthly packets over time. This entry was posted in A new kind of "Transparency", Freedom of Information Act, Legal Problems, Supervisor Gonser and tagged Gonser, Jeanne Langlois, oakland township, Oakland Township Board, Supervisor Terry Gonser, Terry Gonser, Transparency on July 1, 2015 by richardjmichalski. Thank you Richard for putting that together. While I support the notion that the antics of the new board especially the supervisor have driven increases in legal fees, I’m concerned about falling completely into a correlation equals causation trap. The Harvest Corners spike in the data is of particular note. That was a big spending year. With the new board came Blossom Ridge, water tap fee, and the frivolous Parks and Recreation Commission suits. Most voters knew when we voted on Blossom Ridge that lawyers would be involved later. We the voters put that in motion. The water tap fee could have been handled better. However the developers could have given the board up to a half year but no, they lawyered up first. That problem was years in the making and the developers were not willing to wait a few months to see what the board would do. The Park’s Commission debacle was almost purely Commission antics. So thank you again. I had considered filing FOIA to see how much all the FOIAs have cost us tax payers. I believe that is in the data you provided so no need now to “pile on”.